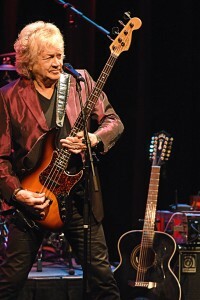 John Lodge live is all of the above and more, as evidenced on his recent live album and DVD, “Live from Birmingham: The 10,000 Light Years Tour.” You definitely don’t want to miss the Moody Blues’ legendary bass player’s show on Oct. 17 at the City Winery in New York City. Lodge’s setlist on “Live from Birmingham” is the perfect combination of Moody Blues material and songs from his superb solo album, “10,000 Light Years Ago.” The disc, released in 2015, was Lodge’s first solo record in 38 years. A stirring rendition of “Candle of Life,” never before played by the Moody Blues, a rousing “Saved By the Music” – a special treat from Lodge and Moody Blues bandmate Justin Hayward’s “Blue Jays” album – and an awesome rendition of “Ride My See-Saw are among the other many highlights. At age 73, Lodge’s energetic performance puts artists more than half his age to shame. The band, deservedly, were inducted into the Rock and Roll Hall of Fame in 2018 and played a residency in Las Vegas in September. Lodge recently released a free single for his fans. “Get Me Out of Here,” from the live album, is available at store.cdbaby.com/cd/johnlodge7. We recently had the pleasure of speaking with John Lodge. You’ve been touring for more than 50 years. What keeps you going? I think it goes back a long way. I did my first gig when I was 15 years of age. I just enjoy gigging. There’s a lot of reasons. When you write a song in the middle of the night you don’t know whether anyone is going to hear it. The only way to make sure is to perform it on the road and see if you can relate it to an audience. I have that gypsy inside of me wanting to know what the world is all about, traveling and wanting to play music for people and to see and meet some amazing people. How do you like playing intimate solo gigs as opposed to larger venues with the Moody Blues? With the Moodys when you tour there’s lots of trucks, buses and airplanes. You don’t really see anybody until you walk onstage. Obviously onstage with the Moodys is terrific. When I’m touring on my own we all travel in one bus and we talk about rehearsals and the concert the night before, the sound and the running order of the songs. It’s a very enjoyable experience. It’s nice being in an intimate venue like the City Winery where you’re really close to the audience. How do you decide which Moody Blues songs to play live and how to balance the set between those songs and your solo material? I try and take the audience through a musical journey so at the end something happened to them emotionally. I can perform songs we don’t do with the Moodys like “Candle of Life” or the Blue Jays “Saved by the Music.” It opens up a whole different panorama for me. How is the setlist looking for your current tour? On this tour I’m doing something different again. We’re going to do a couple of songs that are a tribute to (founding and former Moody Blues member) Mike Pinder and Ray Thomas (the Moody Blues co-founder died earlier this year). Your album “10,000 Light Years Ago” was your first solo effort in 38 years. What inspired you to make the album? I’m always writing songs and half the songs I just record for my own enjoyment. I’m also involved with a few charities and I write songs for them. What inspired me to do another solo album was 180 gram vinyl coming back. To me that’s the greatest sound there is. I suppose I wanted to release an album on 180 Gram. Plus you’ve got all the information about the album, the double sleeve, it’s a whole picture of the record. If you look at the sky at night you see all these wondrous stars and planets and they are light years away. They are a reminder that the past is gone forever, but the future is always in reach. You sound incredible live. Can you tell us about the musicians who round out your band onstage? I’ve been very fortunate to get some incredible musicians to join me onstage. They’ve become the embodiment of my music. They give it their all. The live album was recorded in Birmingham Town Hall. When I was 13 my hero was Buddy Holly and he was appearing there and I managed to get a ticket. I thought if I ever record a live album that it would be there. How did it feel being inducted into the Rock and Roll Hall of Fame earlier this year with the Moodys? Fantastic, especially with the band being from England. Rock was born in America. We simply repackaged it and sent it back. It is a huge honor. It’s brilliant. More information: johnlodge.com and moodybluestoday.com.